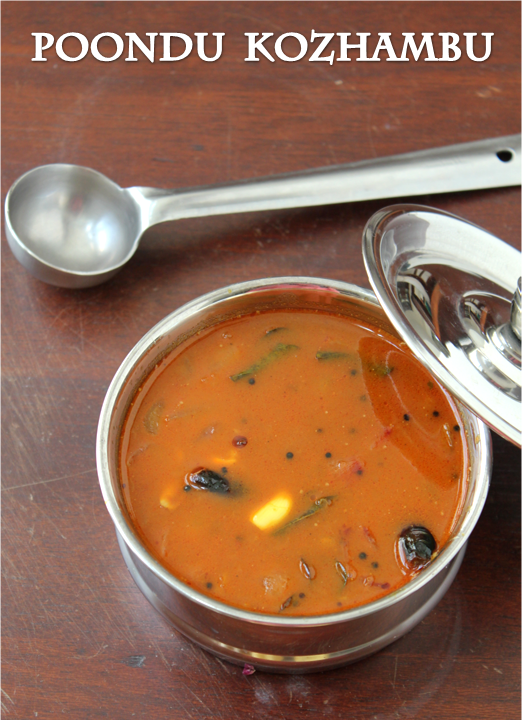 Poondu Kozhambu is a very common Tamarind Gravy in any Tamil home.Without any doubt, it is most people's favorite too! All of us love it in our house too ! There are so many ways of making this gravy but mine is quite simple. I make it on Sundays with a lot of garlic in it and make it with more of onions on weekdays. I am posting this especially for a friend !! It tastes great along with hot rice and some gingelly oil and a roasted papad to go with it.It is easy to prepare and it goes well with idli or dosa too!!! 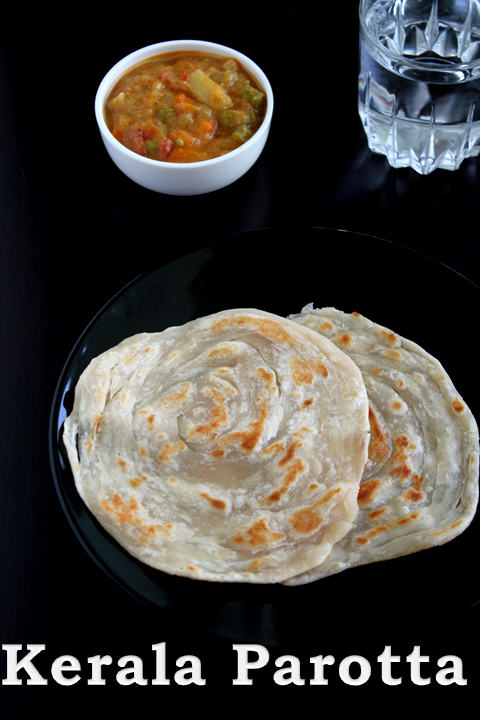 Parathas are mainly made in North India with wheat flour.When it travelled to the South, people started making it in Maida or all purpose flour.The Malabar Parotta is famous in Kerala.The speciality of this Oarotta is its layers.It requires lot of patience and hard work to make this one. 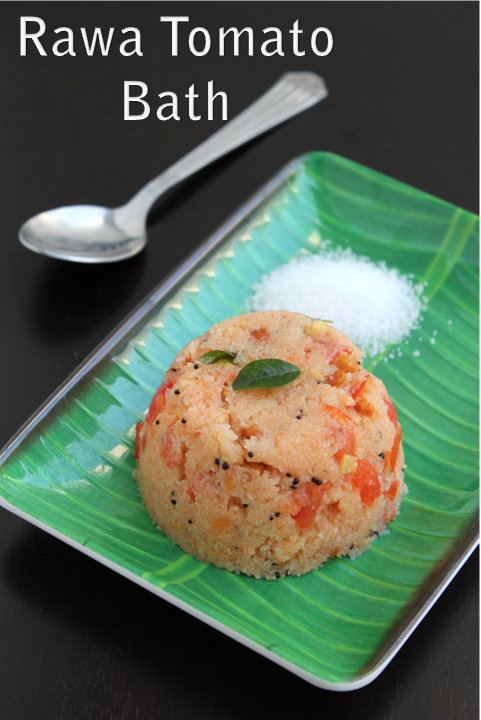 Let's see how it's done..
Left over Idlis can disappear in a few seconds when made in to this Idli Upma! 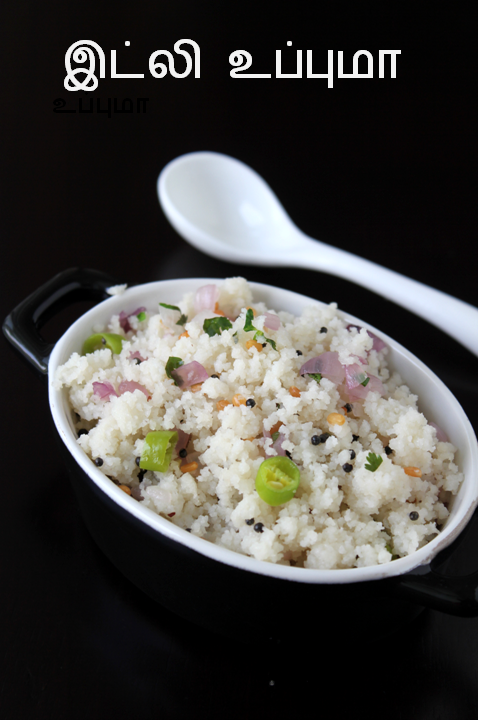 !Lot of people prefer Idli Upma to normal Idlis. It does not require any chutney or accompaniment to go with.The crunchy Dal and the spicy chilli in the Upma make it really tasty. When I have leftover idlis from breakfast I refrigerate it until next morning.It really becomes hard and easy to crumble in the mixer.If you are making Upma in the evening, with the morning idlis crumble it with your hands. It becomes really soft when sauteed with the spices and onions.You can even sprinkle some idli chilli powder as an option. I was not aware of Momos when I was a child, but the recent explosion of International cusines has exposed all of us to a lot of cuisines. 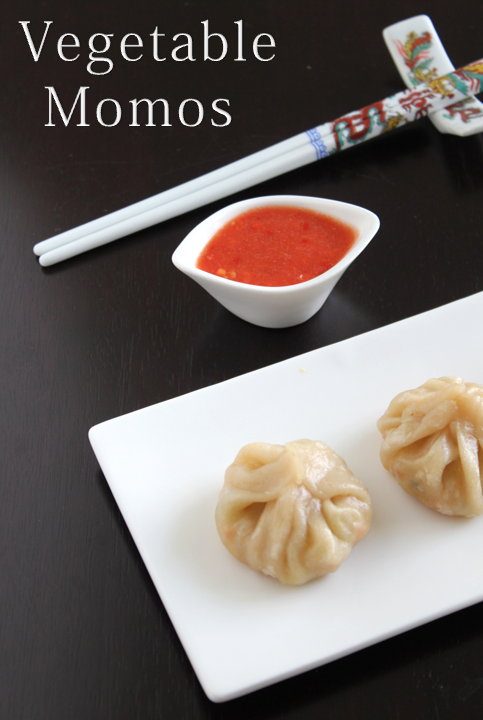 Though Momos is not one of my favourites, once in a while I would like to try these new recipes.When I was out for a sale at a hotel, they were selling freshly prepared momos at the entrance and I picked up a few for the kids. That's when I thought I should give it a try and it came out pretty well! Momos are flour dumplings filled with vegetables and steamed. It is usually served with chilli garlic sauce or dip.It is very easy to make you can soak a few chillies in vinegar for ten minutes then grind it along with a few pods of garlic and add some salt and honey.I added one tomato too, which is purely optional. 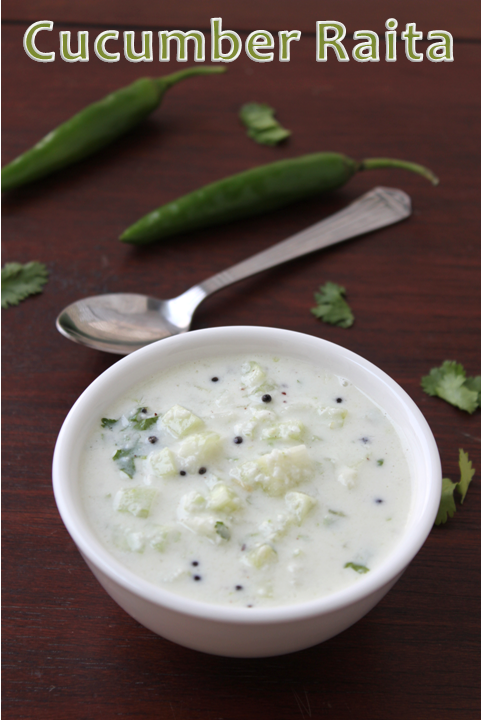 Cucumber raita called Vellarikkai Thayir Pachidi in Tamil is nothing but chopped cucumber in yogurt with green chillies and salt. It is made in different ways in north and southern India.The North Indian version is an accompaniment to Oulaos and Biryanis,but in the south it is an accompaniment for the south Indian gravies and it is part of most of the festival and wedding menus. You can either shred the cucumber or chop them into small pieces,remove the excess water and mix it with the yogurt and chillies. The traditional way of making is make a paste of scraped coconut and green chillies and mix it with yogurt and add the chopped cucumber and Temper with mustard seeds and garnish with coriander leaves.That is how i made it!! When you make a spicy gravy this is a perfect accompaniment!! !Today being Thiruvadhirai I made the ezhukari Kozhambu which is really heavy so just made a raita to go with it! Rawa Tomato Bath is nothing but upma with a lot of tomatoes or rawa cooked in tomato puree.I remember my mother making this upma for my grandmother in the evenings whenever she used to fast or just eat once a day.She was a no onion and no garlic person so this was her main dish on her 'fasting' days.It is so tasty that when my grand mom starts to eat i would wait for her to offer me a bite and she would definitely give me one. It is very easy and simple to make with very simple ingredients and it gets done in no time.My mother used to drizzle a tsp of ghee on top and it tastes heavenly with just a tsp sugar as an accompaniment. Lot of Children are fussy about tomato pieces so my aunt used to cook it in tomato puree to avoid the mushy tomato pieces.You can try that too! 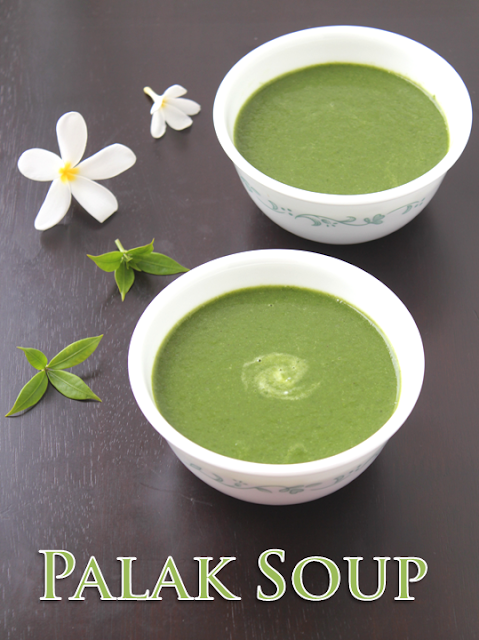 There cannot be a healthier soup than this palak soup. My daughters are a big fan of soups, especially 'Tomato'. I thought let me make this creamy,soothing and healthy soup (let them get a taste of other soups too). Since i have tried so many Subzis with Palak, this soup is a new try.I tried this soup in a restaurant in Bombay few years back. 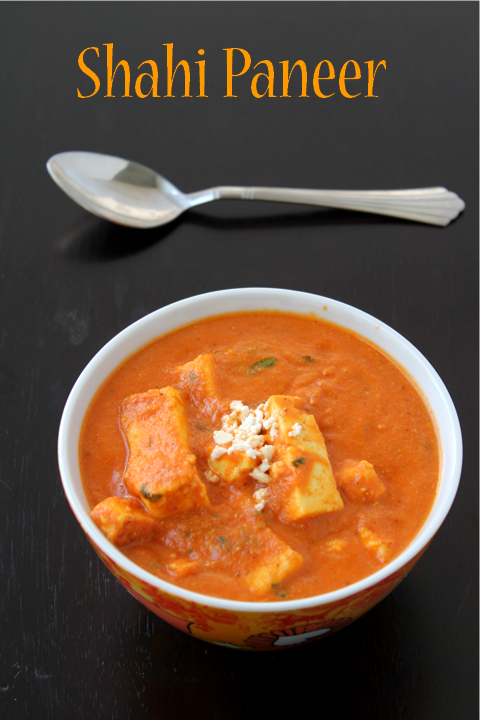 Shahi Paneer is one more tasty and rich paneer recipe.I have been wanting to make this recipe for sometime.Its richness and colour makes it really tempting.It is a perfect accompaniment for tandoori nan or roti. 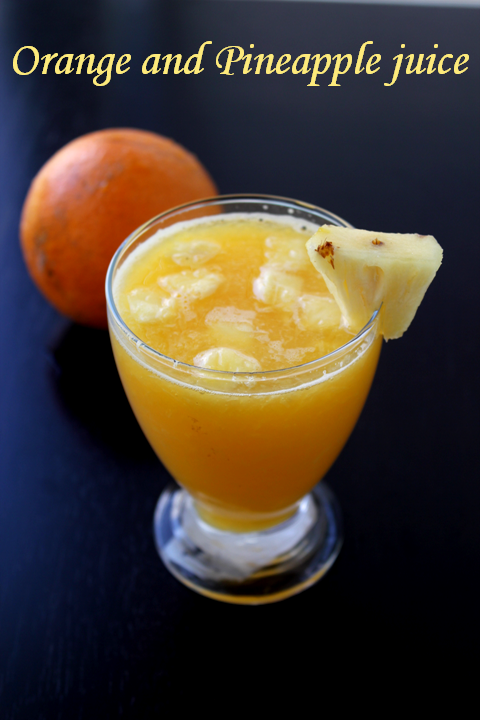 I tried this sweet and sour taste juice from this lovely combination of Orange and Pineapple freshly blended with a dash of ginger. We all know most of the benefits of fresh fruits.Pineapple has many minerals and vitamins that are essential for optimum helath. Oranges have been long valued for their wholesome nutritious and antioxidant properties.Oranges are so rich in vitamin C and many proven health benefits. You also try this juice and drink healthy and enjoy!